To take Indo-Russian relations to the next level, both countries need to harness their soft power and reach out to the masses. On faintly hearing the voice of a little Russian girl at the gate of a kindergarten in Bangalore recently, I assumed that my niece had a Russian classmate. But as I walked closer to the classroom, I realized that the children were watching “Masha and the Bear,” a Russian animation series. The clip had English subtitles and the teacher was busy explaining the situation and dialogues, but then children at that age understand a lot more than we give them credit for. Pleasantly surprised, the scene reminded me of another generation of young Indians who watched “Nu Pogodi,” the Soviet animation series about a wolf and a rabbit. In Bangalore in 2013, the bright young minds of tomorrow were getting their first taste of Russian soft power. It’s fair to assume that the great reach that the countries had in each other’s societies is a thing of the past. Russians no longer queue up to watch the latest Bollywood blockbuster, although some swear by their collection of the latest Shah Rukh Khan films. In India, the cultural invasion from America has ensured that the upwardly mobile youth of the country look West and not “North.” Despite what looks like a glum scene, there is enormous potential for Russia and India to harness and build soft power in each other’s countries. In this area, India has a great advantage, since many member s of the older generation in Russia have a tremendous amount of goodwill for the colourful tropical country. Bollywood films were watched by Russian families as they mostly had innocent story lines with romance and more often than not had a happy ending. While the well-heeled of Russia know of India’s various problems, there is still a sense of admiration for the country since many view it through the Bollywood-coloured spectacles. Among the westward-leaning Russian youth, India has now become fashionable since the country is vogue in Europe. 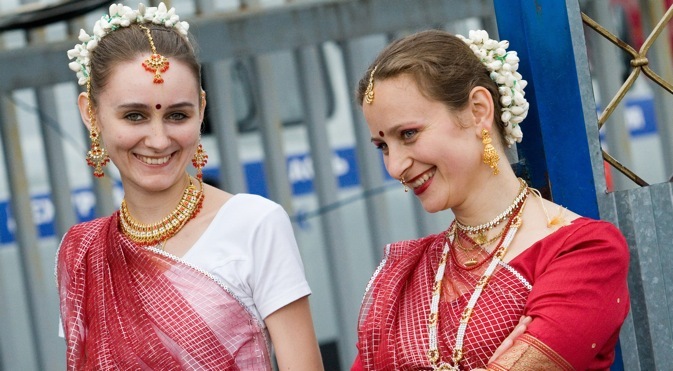 Of course, the increased media coverage of rapes in the country haven’t exactly given India’s image a boost, but elements of Indian culture like yoga, Indian jewellery, fashion and vegetarian food is gaining popularity in Russia. Believe it or not, many Russians are of the opinion that Bollywood still has a ready audience in their country and that has prodded many Indian film distributors to seriously re-explore the Russian market. One wouldn’t expect the intellectuals of Russian society to queue up to buy tickets to see a masala picture, but there are many in the country who still feel fascinated with “exotic” India. For Russia to reach out to ordinary Indians, there are many barriers and stereotypes that need to be dispelled. Thankfully, with the exception of the JNU-types, few in India see Russia through a Soviet prism. Russia for Indians is now the land of snow, Maria Sharapova, Vladimir Putin and the (sigh) mafia. Russia’s greatest element of soft power in India is its great literature. Anyone claiming to be an intellectual in the country would have read the works of Tolstoy or Dostoyevsky. Then there are the whiz kids who want to become chess grand masters and follow in the footsteps of Vishwanathan Anand. Many Indian families also want their children to learn ballet and as is the case with chess, the Russian cultural centres in India do a reasonably good job of training young Indians. Yet more needs to be done. Cultural organisations from both countries, independent of the government need to play a proactive role in developing soft power. At the end of the day, if there’s an interest for example in Russian music in India, this will also lead to numerous commercial opportunities. Hindi film distributors must be salivating at the thought of Bollywood once again becoming popular in Russia. At the end of the day, it’s going to take a lot more than diplomacy, political interactions and even trade to bring the people of Russia and India closer. For relations between the two great countries to reach that level where the two-way traffic between them quadruples, a strong and dedicated effort is a must to build soft power. It becomes a lot easier to bring the people closer together in the Internet age. Those who want to build Indian soft power in Russia or the other way round, need to look no further for inspiration than the late-Raj Kapoor who did more for the relationship between the countries than the best of leaders or the greatest of diplomats.